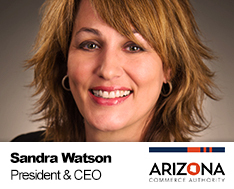 Sandra Watson brings more than 20 years of economic development leadership experience to Arizona. She and her teams have successfully attracted to Arizona more than 750 companies that have committed to invest nearly $10 billion in capital and create more than 125,000 jobs. During her tenure with the Arizona Department of Commerce, and now the Arizona Commerce Authority (ACA), Ms. Watson served in multiple positions with increasing responsibilities and results. She has the led Business Attraction, Business Development, Innovation & Technology, Workforce and Marketing divisions. She served as the Executive Director on the Governor’s Council of Innovation & Technology in advancing the state’s Innovation and Technology roadmap. Ms. Watson began her career in Canada and brings not only a wealth of knowledge on the regional, state and national levels but can execute effectively on an international scale. Ms. Watson is a collaborative leader who excels in strategic thinking and relationship building. She worked tirelessly to implement the new vision for the Arizona Commerce Authority, providing invaluable leadership and stability during its transition from the Department of Commerce into one of the nation’s first public-private partnerships focused on economic development. She was instrumental in guiding the implementation of the ACA’s aggressive five-year business plan promoting the state’s pro-business, competitive value proposition. Under her leadership, the ACA has transformed into Arizona’s leading economic development organization, and advances its three-pronged approach to strengthen the overall economy: recruit, grow, create – recruit out-of-state companies to expand their operations in Arizona; work with existing companies to grow their business in Arizona and beyond; and partner with entrepreneurs and companies large and small to create new jobs and businesses in targeted industries. She earned an Honors Bachelor of Commerce degree from Laurentian University, and has completed the Global Leadership Certification program at the Thunderbird School of Global Management. In addition to serving on numerous regional and statewide Boards of Directors, Ms. Watson serves on the Board of Trustees for the State Science and Technology Institute, a national organization focused on promoting technology-based economic development, and is a board member of the Make-A-Wish Foundation of Arizona. In 2014, the Phoenix Business Journal recognized Ms. Watson as one of the 25 “Most Admired Leaders in Business” and Az Business selected her for its 2014-15 Az Business Leaders publication spotlighting Arizona’s most respected and influential business leaders. In 2013, Az Business also recognized Ms. Watson as one of the “50 Most Influential Women in Arizona Business.” The Phoenix Business Journal in 2012, recognized Ms. Watson among the “Top 25 Women in Business,” one of the 2008 “Power Players in the Phoenix Metro Area,” and in 2004, recognized her as an up-and-coming Arizona leader, with its “Forty Under 40” designation. Ms. Watson is also a two-time recipient of the Arizona Technology Council’s Chairman’s Award (2003 and 2010).